High dose Vitamin C IV therapies are often used as a supportive medicine for cancer treatment between chemotherapy and radiation treatments or for use with chronic diseases including lyme, hepatitis or other bacterial/ viral infections. 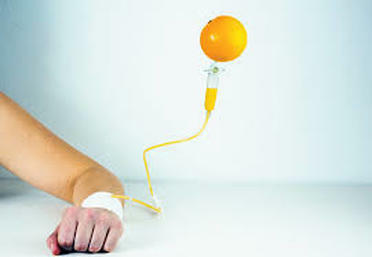 High dose IV vitamin C patients must complete a full assessment in office and have additional lab work completed before starting any treatments above 15 grams Vitamin C. These labs include G6PD screening, liver function, kidney function and blood sugar analysis. These labs can be requested either by Dr. Coombs at an additional cost or by your MD at their discretion. Often because high dose vitamin C treatments are prescribed multiple times per week, patients are concerned about the cost. Our IV treatments are based on dose and ingredients, therefore are difficult to quote without first doing an in office assessment. Vitamin C doses are increased over several weeks from beginning doses of 25g to achieve higher doses such as 50-75g. An estimation for a 50g IV vitamin C treatment (including minimal amounts of magnesium, calcium and potassium) would be $139. Specific quotes for different amounts and other additional nutrients can be done in the assessment visit. We can often find a formula that can fit into most budgets if this is an issue.